Get ahead of the game and start booking now! Graduating is a huge moment in anyone’s life and it deserves to be celebrated with the people that helped get you there, your friends and family. Before the party can kick off the planning must begin. Invitations must be sent out and supplies must be gathered to handle all of your guests. The best way to gather what you need for the party is to rent what you need for your graduation party. 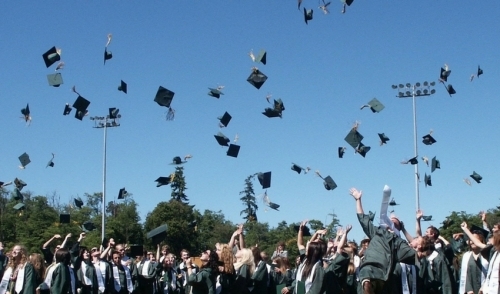 Tyler Tents & Events can offer you a huge range of essential graduation supplies as well as original items to make your party is extra special. There are many supplies or themes you can choose from. Some people like to keep things simple with a barbecue, but many folks like to go all out with themes. Start with renting the essentials. The essentials are tents, tables, and chairs. Tents, tables, and chairs serve as the foundation of any party. No party is complete without them. Your guests have to have a place to sit, eat, and get out of the sun or away from bad weather. Tents, tables, and chairs serve as a foundation of any party. Tents come in all shapes, colors, and sizes. However, out of all the supplies, tents are rented out the fastest so make sure to call your local rental company early to reserve yours. To have a general idea, a 20’ x 20’ tent can hold up to 40 people. Consider renting side panels also to block the sun and wind in areas of your party where it’s needed. Rent all your large accessory items such as grills, ice buckets for beverages or kegs, and serving supplies. Many individuals know someone who can potentially lend these items, but if not, we will have all these items readily available especially during this time of the year. The final and most important step to throwing the best party is renting the entertainment. Consider renting speakers, DJ equipment, or even a karaoke machine so that the party is filled with good music and positive vibes. Nothing brings people closer together than good music. Think outside the box and go distance by renting other fun items such as a photo booths, carnival games, watersports, moonwalks, and even sumo costumes. Don’t forget about the adults either. Try renting keg towers, party bars, and casino tables so that everyone can take part in a little fun. When renting for your graduation, the options are endless. Don’t be afraid to use your imagination and rent something totally out of ordinary, but your guests will still enjoy.